We boarded the bus to Warsaw at around noon – it was an unremarkable ride, but it was far better than the same route we took four years before. First, the bus was not very crowded, so we had ample leg space. Renata’s parents made us a few sandwiches for the trip, which we ate during a twenty minute stop somewhere near Lublin and washed down with some ice-cold Warka beer. The weather was quite nice, so it was a great opportunity to see the landscape and the countless towns that we crossed during the trip. We reached Warsaw at around 4 PM – the bus dropped us off in front of the Palace of Culture (more about that later). We then located our tram station and headed to the Best Western Felix hotel, which is located in a more residential area located about 20 minutes from the town center. It is not exactly a luxury place, but it had minimal comforts such as free Wi-Fi and an outdoor garden. They did not offer free breakfast, but the hotel was conveniently located near a supermarket, so I was able to purchase everything we needed for our first meal of the day. During the planning phase of the trip, we were aware that our friend Marta would be in Warsaw at around the same time, so we made plans to meet. Renata had a Polish-issued pre-paid phone, so it was easy to communicate with her and arrange to meet. Marta was staying with her parents just outside of town, so within a few minutes we were all together planning where to go out to. Marta suggested her childhood neighborhood a couple of stops away. 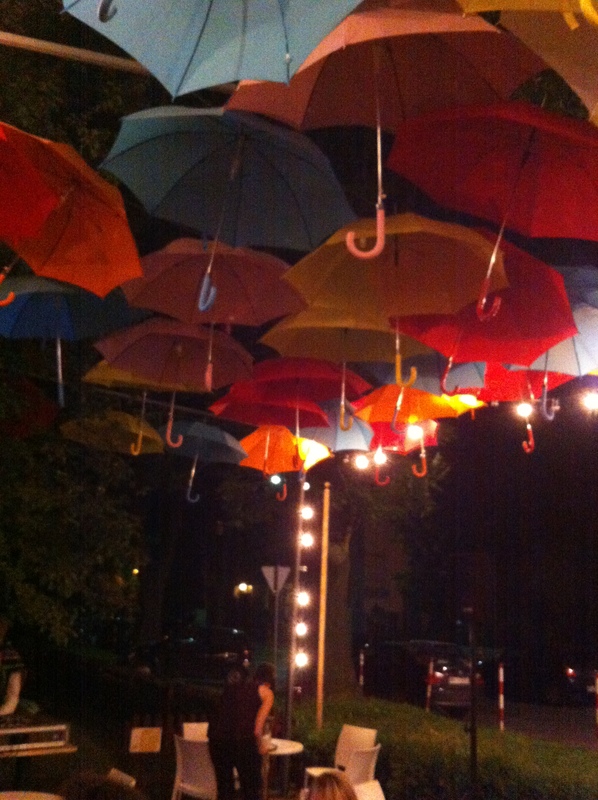 We walked around for a while and settled on a Ukrainian restaurant called Ukraińskie Smaki. After browsing the menu, I chose chicken cutlets filled with cabbage and mushrooms with a side of potatoes, while Renata went with pierogies made in the style of their neighboring country. Poland is not a country where wine is as readily available as in New York, so we settled for a large glass of beer instead. After the meal, walked to a nearby café called Francuska Trzydzieści (AKA F30), where Renata had some mulled wine while I had a locally crafted beer that whose name I cannot recall. The next day the weather was not the best – it was cold and raining on and off (such is my luck in Poland) so our planned stroll around the neighborhood was put on hold. At around 11 AM Marta and her father came to our hotel and picked us up since we had planned to have lunch with her family. The ride took about 30 minutes, and soon we were there – what a difference it was from the city. Marta’s parents live in Sulejowek, a town that serves almost like a suburb to the main town of Warsaw. It is connected to the city by a rail line, and many streets are unpaved, like Long Island must have been a few generations ago. The houses look pretty large, and according to what I was told one of them – almost a mansion – belongs to a well-to-do financier. As we walked in we met Marta’s parents and her young niece. They asked us if we wanted some coffee or tea, and I asked for coffee. Soon the table was piled with sweets, fruit and cookies. I was explained that this was Polish hospitality, and ‘having a cup of coffee’ was not what it is in the States. I tried not to eat much, because I knew lunch would follow. Before lunch, the three of us went for a walk around the neighborhood, and once we came back the meal was served. What a lunch it was – before us was a huge platter of golabki (stuffed cabbage) and diced potatoes. Early during the meal, Marta’s father brought in a bottle of wisniowka, a homemade drink made of high-proof vodka infused with black cherries for months on end. Once ready, it packs a good 40 percentile of alcohol. It is not overtly sweet, and it somehow resembles a strong port wine. 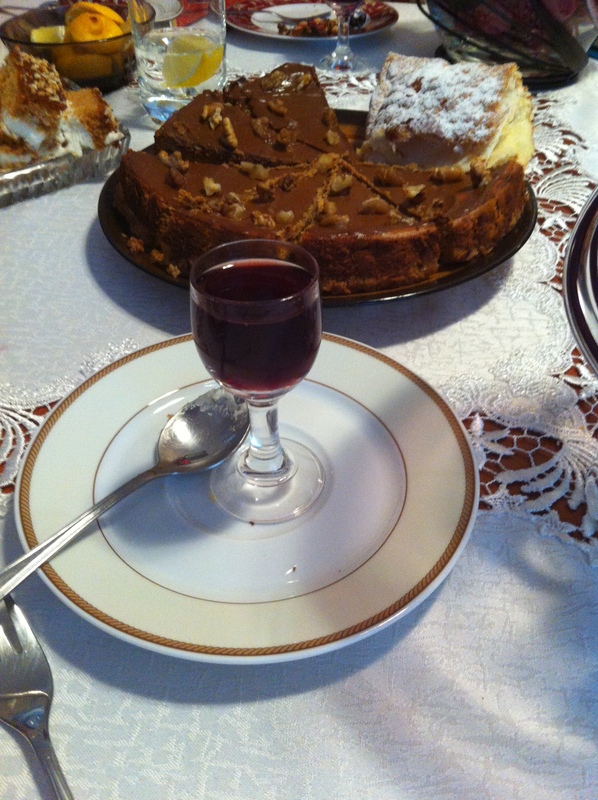 After the meal, the sweets came back, and our glasses were constantly refilled until the bottle was practically empty. Marta’s father then gave us a ride back to the city, dropping us off at the entrance to Warsaw’s old town. We walked for about an hour, and came across an outdoor photo exhibit commemorating the 25th anniversary of the end of the communist government in Poland and the changes that took place in the city over the years – the revitalization of the Old Town and the development of other areas of the city and so on. They also looked at the negative side, such as the increase in homelessness and the disappearance of small diner-like cafés. 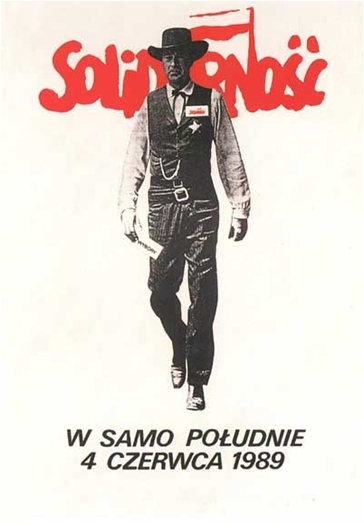 The poster of the celebration shows a still from the classic Gary Cooper film “High Noon” in which his character holds a ballot instead of a gun – the image was used in 1990 to encourage voters to the polls – behind Cooper is the phrase “High Noon, June 4, 1989.” The exhibition also notes the 10th anniversary of the country becoming part of the European Union – an event also celebrated with a video clip featuring a snippet of Paul McCartney’s “Hey Jude” recorded live at a concert he played in Warsaw. The sun finally came out again on our last full day in Warsaw, and we made the best of it – e, first we walked around the Palace of Culture and Science, a massive Soviet-built structure that encompasses movie theaters, performance spaces and universities. The central building is the tallest in Poland, and on the top floor there is a viewing area, which we did not visit. We then walked to Zapiecek, a traditional Polish restaurant that is part of a small franchise of sorts with locations in Warsaw and Cracow. 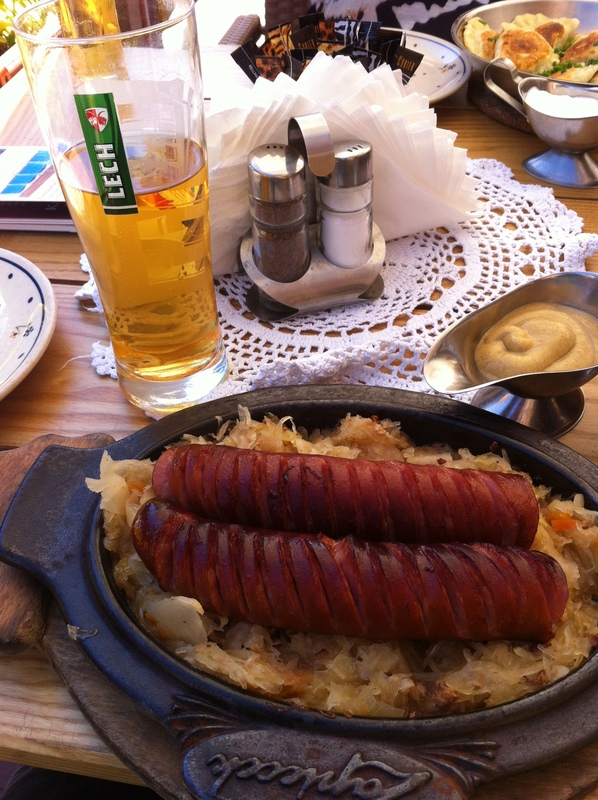 I ordered kielbasa (sausage) served over sauerkraut and bread on the side, while Renata went for pierogis. 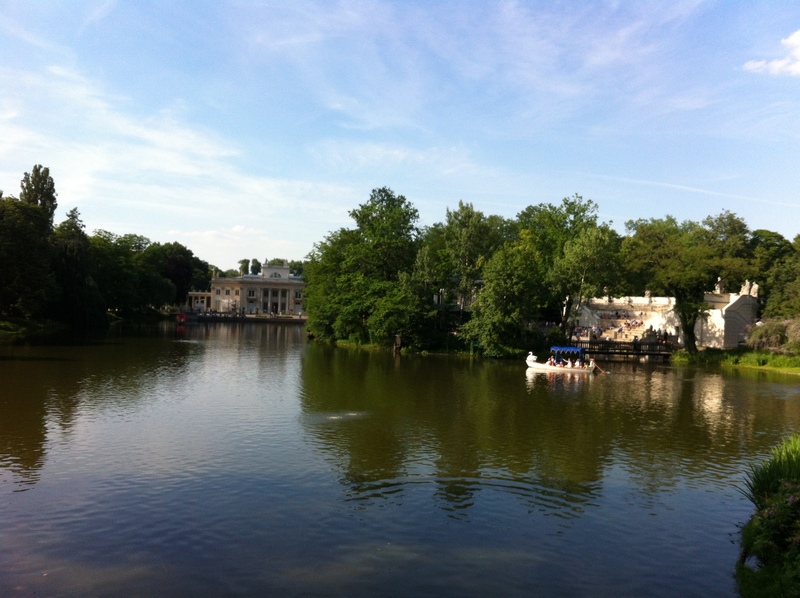 After the meal, we walked over to Lazienki Park – a large green area akin to New York’s Central Park, where during summers they hold classical music concerts. Unfortunately, we were not able to hear one since they take place on Sunday afternoons and we were leaving the next day. We walked around for a long time and also saw the palace of the same name that is located inside the park – one of the few structures in Warsaw that were not completely destroyed by the Nazis at the end of World War II (they did drill holes in the structure and planned to explode it, but never got around to doing it, but many of the artifacts that used to be inside it were completely destroyed). We then walked back to the Old Town stopping to refresh with a cold beer at an inexpensive bar we’d found the night before and then explored the Old Marketplace, which is now mostly composed of restaurants and tourist shops. I made a point to make a stop at a building that to me symbolizes the reconstruction of the city – years ago I saw a postcard showing what was left of it after the Nazis razed Warsaw and how it looks now – its façade being the only original part of the structure. 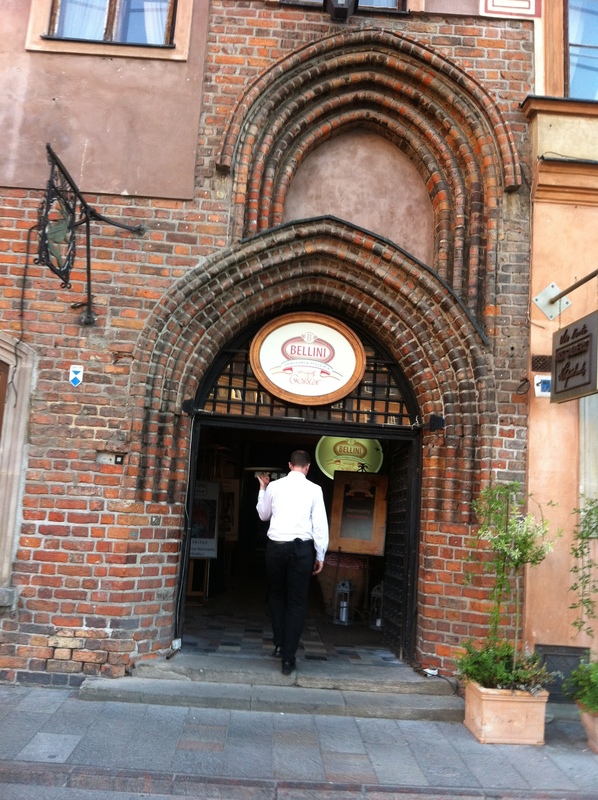 Old Town Rynek, building that summarizes it to me. It was second time I’d seen that building, and once again the moment choked me up – I recall that Renata pulled her camera and asked me to smile, but I just was unable to because of the thoughts that come to me of resilience in the face of pain and suffering experienced by the generation that brought Warsaw back. As the sun began to set, we grabbed something to eat and returned to our hotel to pack up and prepare for the final leg of our trip – the lovely city of Cracow.